If you’re hitting the weights hard or training at a high intensity, this is the essential amino acid supplement. Bio-Synergy BCAA Powder is a premium combination of leucine, isoleucine and valine, in the precise ratio for optimum muscle growth, energy and recovery: 2 leucine, 1 isoleucine and 1 valine. Every serving gives you 5g of high performance BCAAs, as well as beta alanine, caffeine and taurine. This power combo boosts your performance, giving you the drive to achieve more in your workout. And you get these strength and recovery benefits without the usual sugar and calories. We’ve also added vitamin-B6 to boost your body’s metabolism, meaning our BCAAs reach your muscles sooner. That’s why it’s perfect before, during or after your workouts when you need to kick-start your recovery. BCAA 2.1.1 Blend, Taurine, Flavouring, Citric Acid (Acidity regulator), Beta Alanine, Caffeine, Sucralose (Sweetener), Pyridoxine Hydrochloride (Vitamin B6), E133 Colour. 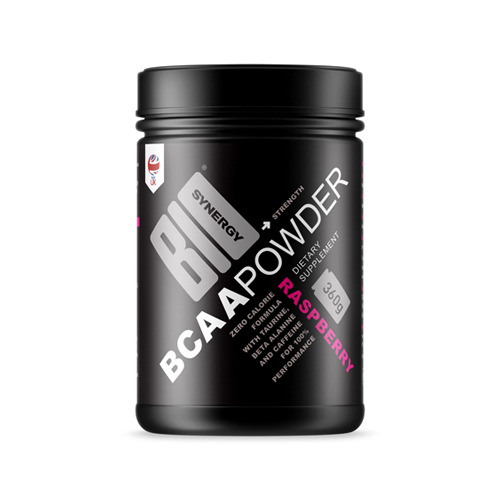 Bio-Synergy BCAA powder is a great pre, post or intra workout supplement. But we feel it’s most beneficial before a workout to help maxmise your training. "Bio-Synergy BCAA powder out is an advanced high performance & delicious blend of amino acids containing 5g of the Branched Chain Amino Acids. Kumar"